Here, our Customer Transformation Coach, Candida rounds up what’s been happening in our weight loss support community this week. We welcome so many newbies to both Secret Slimmers and Momentum Maintainers this week. You have all joined the most incredible community who will support you all the way on your journey; from the beginning to the sweet beautiful end. 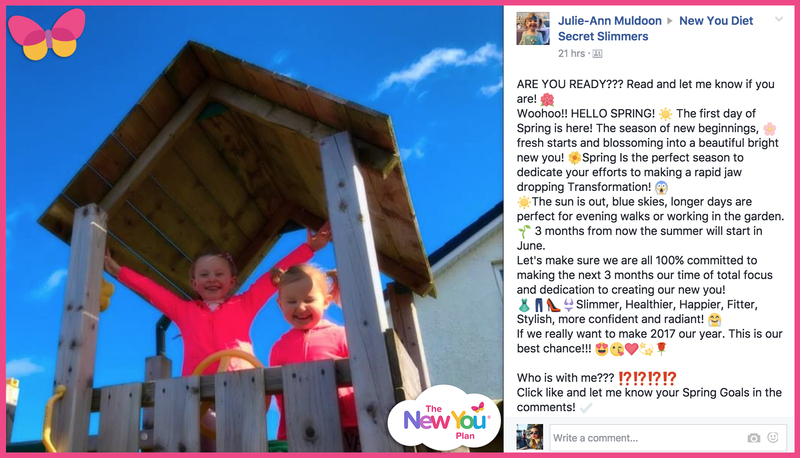 Secret Slimmers has been a hive of activity this week with some fabulous losses once again! 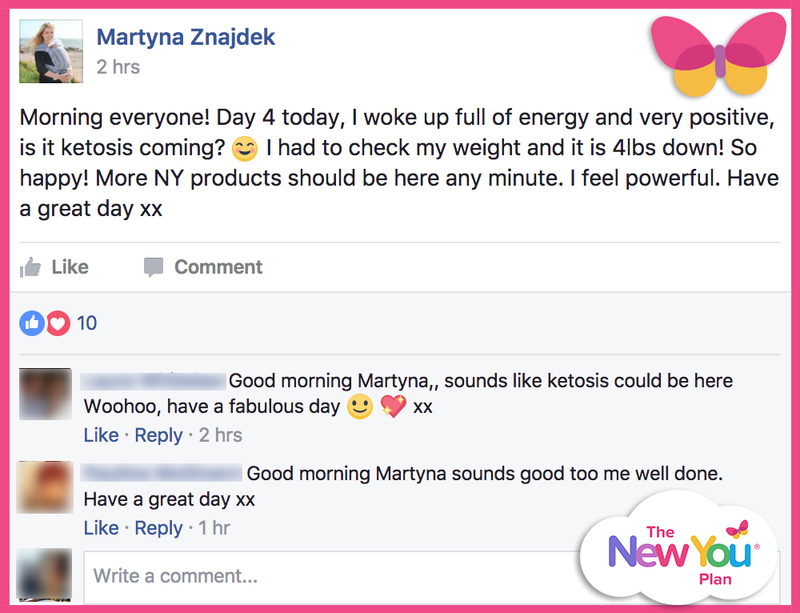 Positivity has been flourishing; Martyna Znajdek had reached day 4 when she said she felt ‘powerful’ – this really resonated with me! In such a short space of time, Martyna has grasped the process and allowed it to transform her mind and body. The lovely Harry Harper is back with a vengeance and lost a whopping 10Ibs in ten days with only 5Ibs to go util he is at his goal! Did you see Joan Cunningham’s post? 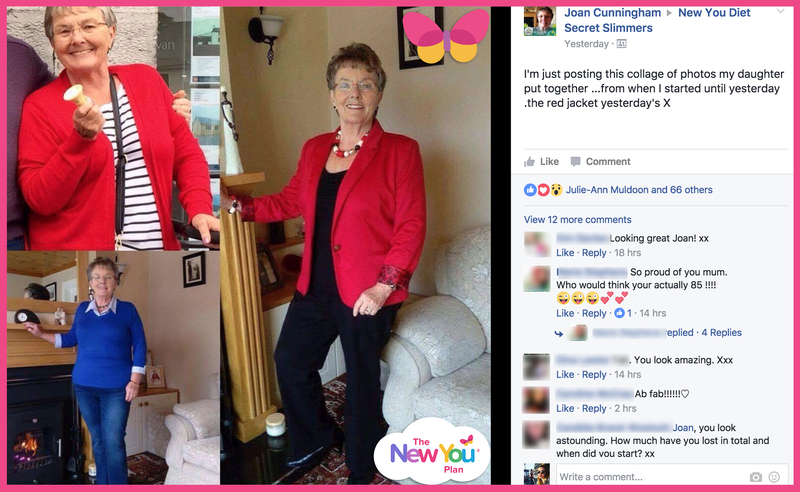 Joan is looking beautiful, having lost 3 stone since October! All these slimmers are 100% rocking The New You Plan! No matter how small or big your loss, it is a loss and you should feel proud of yourself. 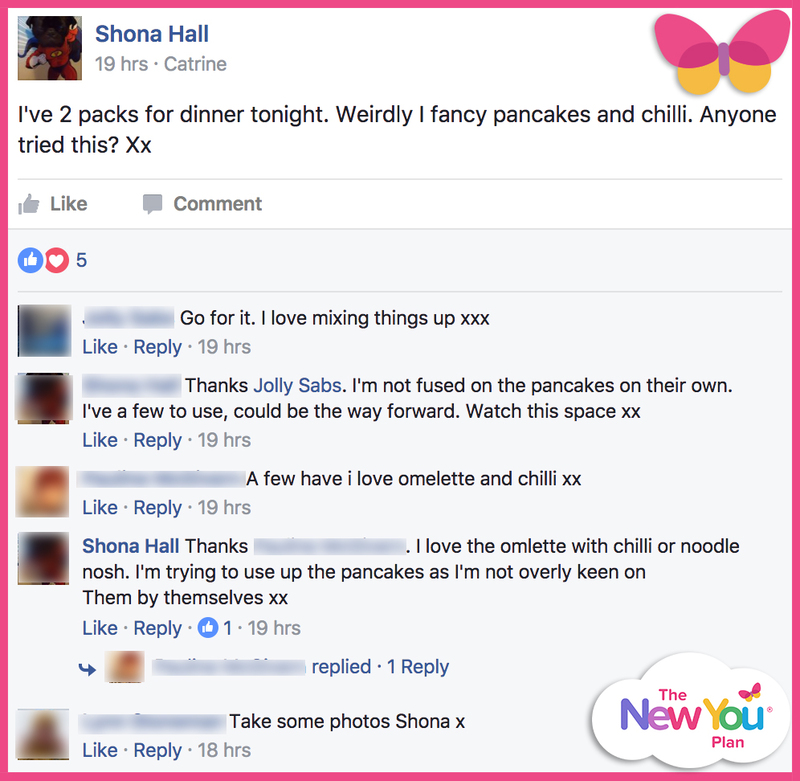 Shona Hall needs a little mention for her unusual sweet and sour concoction and one I intend to try; Maple Syrup Pancakes with Chilli! Genius! We always try to keep Secret Slimmers fresh and exciting. We want it to be a safe haven for you to come, where you can talk about your fist pump moments and your concerns. 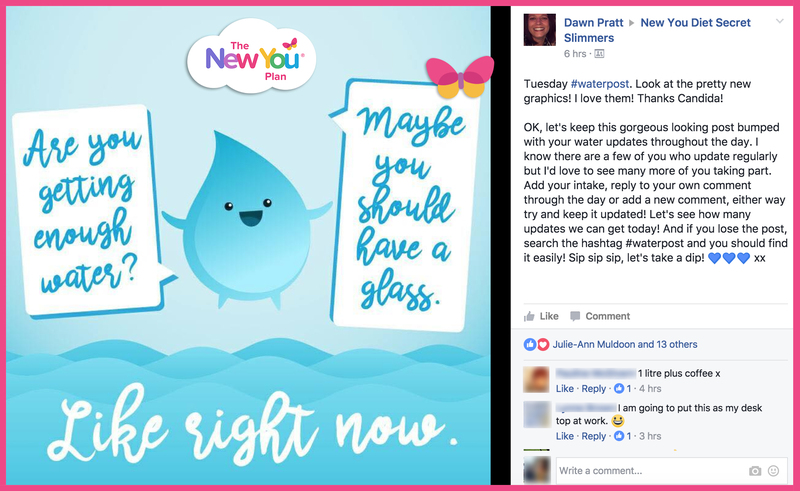 I do hope you noticed our lovely sparkly new water posts this week, which are run by Dawn Pratt. Use these water posts to keep track of your water intake. You can update the post throughout the day as many times as you want. Water is essential to your weight loss and maintenance plan. So, keep sipping! Your wonderful cheerleaders have been as busy as ever helping to solve your issues and support you in every way they can. Each week I introduce you to one of them. This week I have the pleasure of introducing you to the beautiful Val Mulraney. 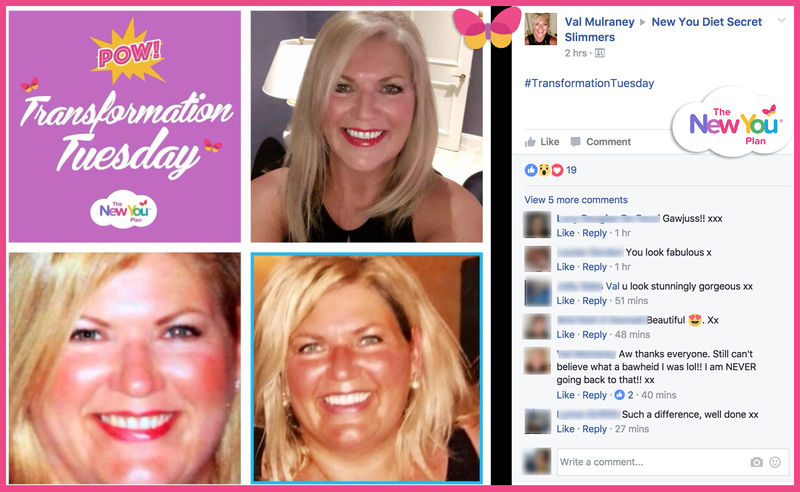 Val is an invaluable member of our team and we are so lucky to have her and her wealth of experience with The New You Plan. Meanwhile, behind the scenes, we have been working really hard on some exciting new projects to make Secret Slimmers and Momentum Maintainers an even more awesome place. Hard to believe? Watch this space! Have a brilliant 100% week and never forget that you are worthy of your dreams! Live the life you have imagined! This Sunday sees the clocks move forward, and with the days getting longer and warmer, now is the perfect time to start your New You journey! And with our incredible Beat The Countdown Clock offer, you can get started for even less with amazing daily discounts on all individual items. But be warned, these discounts will drop each day, until the clocks change! So the sooner you shop, the more you’ll save! HURRY: Offer ends midnight on Sunday 26th March! !